Shipping took longer than it should. Thanks! 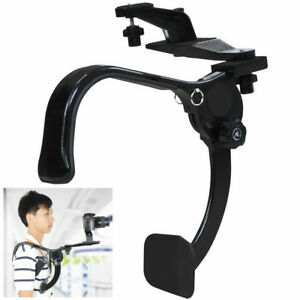 This unit is great for Run and Shoot filming as you can let go of it and be able to use your hands for other things. It rests nicely on your shoulder with good balance, and the mounting accessories can be customized to attach just about any camera. Not really an alternative for a Gimbal or other stabilizer, but it does have the heft to give fairly smooth shots if you learn to use it. At the price point, it is a good value. Nice camera mount for the price. I wish the strap was a little bigger. If you're a big guy it will not fit. I got this just in time for the Riverside airshow. So many photographers were telling me how cool this item was and where did I get it. Can not wait till the next airshow comes around. Do not even think about it, just order one if you have a super telephoto lens for you camera. It will save you lots of trouble and less to carry. Build quality is acceptable for the price. Works well and well recommended.